A versatile piece of clothing, Mee Mee Tops can be used daily to keep your baby chic and comfortable at home or outside while travelling. Made from premium quality, 100% Cotton, each top has snap buttons opening ensuring quick and easy dressing change for your baby with absolute great ease. Available in many colours & smart designs, they're perfect for a play date or a party or any other baby activity. Made from premium quality materials that are breathable & gentle on baby's skin. Made from 100% natural fibres that have been tested to provide the softest fabric. Stretchable to ensure the most comfortable fit to your child all day. Easy to put on and take off even when your baby is sleeping. Great finish with snap button closures making it easy to change baby's clothes. Available in a variety of smart, chic and fancy designs. Explore the entire range of Tops & T-Shirts available on Nykaa. 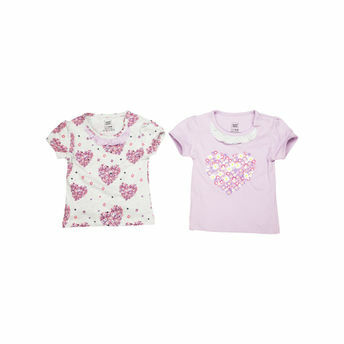 Shop more Mee Mee products here.You can browse through the complete world of Mee Mee Tops & T-Shirts .Alternatively, you can also find many more products from the Mee Mee Short Sleeves Tops - Lilac & Grey Melange Pack Of 2 range.